HHB 428th Field Artillery Brigade"Gladiators"
HHB, 428th FA Brigade provides battery level administrative, logistical, maintenance, Soldier and Family Readiness, and property accountability support to the all Soldiers and Civilians in the Brigade Headquarters and Brigade staff sections. 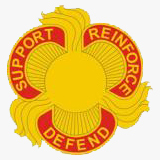 gold color metal and enamel device 1 1/4 inches (3.18 cm) in height overall consisting of a triple-arched scarlet scroll bearing in gold letters the three words “SUPPORT” “REINFORCE” and “DEFEND” on the left, right and bottom arches respectively, and the arches separated by three gold flames issuing from a gold bomb centered on a field of gold concentric rays, the flame tips turned to the left. Scarlet and yellow (gold) are the colors used for Field Artillery. The three bomb bursts symbolize the unit’s three Italian campaigns: Rome-Arno, North Apennines and Po Valley during World War II. 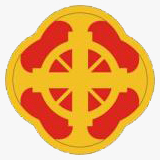 The distinctive unit insignia was originally approved for the 428th Artillery Group on 17 December 1968. It was redesignated for the 428th Field Artillery Group on 7 April 1972. The insignia was redesignated for the 428th Field Artillery Brigade and amended to revise the description on 9 November 1978. On a scarlet quatrefoil 2 1/2 inches (6.35 cm) in diameter, a yellow wheel surmounted by a yellow cross potent with a curved fin-like segment issuing from each end, all with a 1/8 inch (.32 cm) yellow border. Scarlet and yellow are used for Artillery. The wheel and cross potent (simulating the muzzles of guns in action) symbolize the basic mission of the organization. In addition, the numerical designation of the unit is indicated by the quatrefoil, two colors, and the eight segments between the spokes of the wheel and cross. The shoulder sleeve insignia was approved on 23 October 1979.